An independent Disciplinary Commission ruled that Birmingham had exceeded the £39m allowable losses over a three-year period (up to the end of the financial year, 2018). The club's accounts for the 2017/2018 campaign showed a loss of £37.5m for that single season. The EFL felt there was no attempt to curtail spending and the club's losses thereafter, so these have been listed as aggravating factors in the EFL's case against Birmingham. Birmingham said in a statement on Friday evening: "The club has put measures in place to ensure future spending is within acceptable limits and since August we have adhered to an EFL business plan, which imposed transfer restrictions upon us. "When the club's owners took over, Birmingham City Football Club was in a dire position and investment was critical across many aspects of the business, including the First Team, Women's Team, Academy and the infrastructure. "Then, as now, decisions by the owners and the Board of Directors were taken with the club's best interests at heart and a determination to halt a cycle of decline and stagnation, with the intention of pushing on to fulfil ours and our fans' ambitions. "This season we have taken significant strides forward on and off the pitch and the owner's commitment and intention to drive continued improvement of the club's fortunes will not diminish. "Under manager Garry Monk, we have a very tight-knit squad of players who have performed with a sense of belonging, pride and passion. We have no doubt that will continue right to the season's end. "The backing of our fans has been integral, too, and the club is grateful for their support, their belief, and the connection that has been re-established between all of us who care deeply about Birmingham City Football Club has been pleasing to see. "Birmingham City Football Club notes that it has 14 days in which to appeal the decision of the independent Disciplinary Commission and with that in mind we will be making no further comment." The punishment is a first under the EFL's new Profitability and Sustainability rules that were introduced at the start of the 2016/17 season. It is a landmark ruling and one that will set a precedent for any future punishments for other clubs who fall foul of the EFL's financial rules. 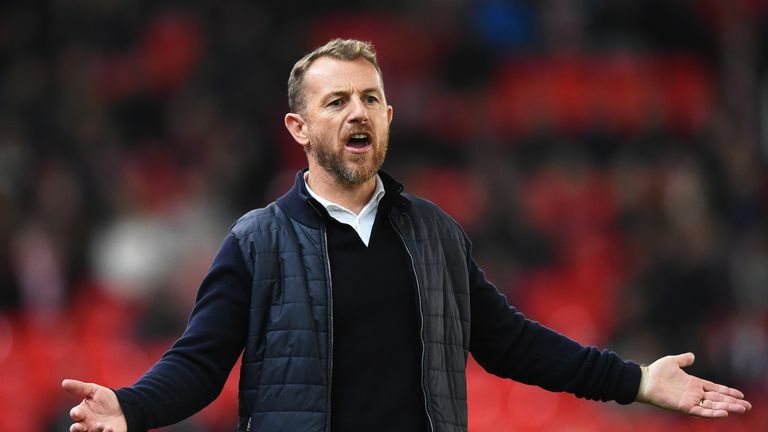 Former Birmingham manager Gary Rowett says the club's recruitment policy is the main factor behind their financial problems and subsequent points deduction. An EFL spokesman said in statement: "The Profitability and Sustainability Rules, aligned with those in the Premier League, became effective in 2015/16. "Season 2017/18 was the end of the first full reporting period with Birmingham City the only club found to have breached those requirements, when it incurred adjusted losses of £48.787m, £9.787m in excess of the permitted losses. Sky Sports News understands Birmingham will remain with an 'Imposed Business Plan' for the remainder of this season, which means they have to share and discuss all significant financial dealings with the EFL. It is understood the club are not now under a 'soft embargo' and they will not face a transfer window ban this summer, but discussions about the future will continue with the EFL. Birmingham will be able to enter into contract negotiations with their captain Michael Morrison for the first time with the 'soft embargo' now lifted. Morrison's current deal expires in the summer. Analysis: Is relegation a real threat? Sky Sports EFL reporter Simeon Gholam: While a nine-point deduction is not as disastrous for Birmingham's season as 12 points would have been, all of a sudden the club are looking nervously over their shoulders rather than trying to chase down the sides above them. The club are in relegation form as well. They have suffered four defeats on the spin and it does not get any easier for them from here, as they face three of the current top four right after the international break. A visit to West Brom, live on Sky Sports Football, is followed by Leeds and Sheffield United visiting St Andrew's. Ipswich and Bolton may be out of touch of the rest but Rotherham, Reading, Millwall and Wigan will all be just below them in the table and Garry Monk's side have well and truly been sucked into that fight to avoid finishing 22nd. Six weeks ago a dramatic 4-3 win at QPR had seen them move to within two places and four points of the play-offs. A season that could have concluded with a trip to Wembley may now well end with them having to plan for life in League One.